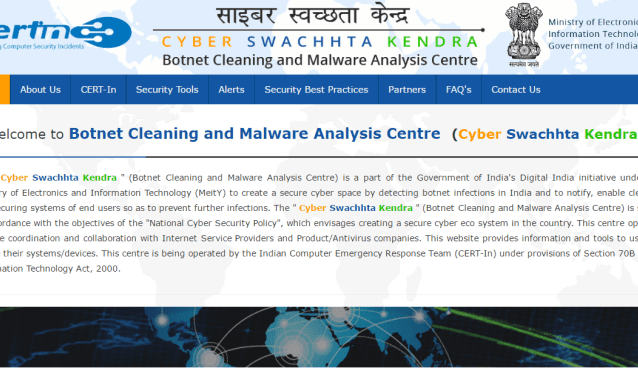 Cyber Swachhta Kendra, a botnet cleaning and malware analysis centre, is a new project led by the Indian government. The project finds its utility in identifying infected users and helping them with removal tools. It includes the development of various security tools for mobile and desktop machines. The government of India has sketched out a 90 crore (INR) project for the establishment of a Botnet Cleaning and Malware Analysis Centre, dubbed as Cyber Swachhta Kendra. The government will facilitate free antivirus software to mobile and computers users in the country. The announcement was made by the IT Minister Ravi Shankar Prasad. The Botnet Cleaning and Malware Analysis Centre will collect details about the systems infected with botnets. It will work with the ISPs, who will have to identify the infected users, inform them, and help them with a link to the Botnet Removal Centre. The users will be facilitated with a Bot Removal Tool -powered by Quick Heal. M-Kavach an antivirus solution for mobile devices is a part of the project which includes security tools like USB Pratirodh – a desktop access control application for connected storage devices, AppSamvid – an application whitelisting tool for Windows OS, and browser extension called Browser JSGuard. You can visit the official website of the Cyber Swachhta Kendra here.